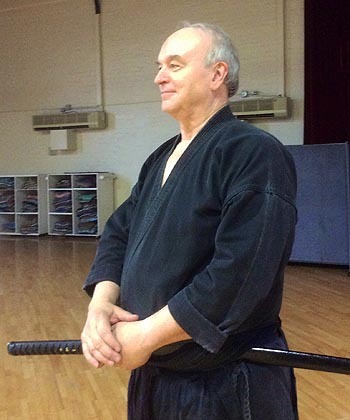 Sensei Gary Myers has been a student and teacher of Iaido for over twenty-nine years. He began studying at the Aikido Center of Los Angeles (ACLA) under the guidance and instruction of Kensho Furuya in 1985. He received his shodan ranking in 1986 after testing in Japan under Takeshi Mitsuzuka Sensei. Myers Sensei was Furuya Sensei’s top ranking assistant instructor from 1986 through Furuya Sensei’s death in 2007. 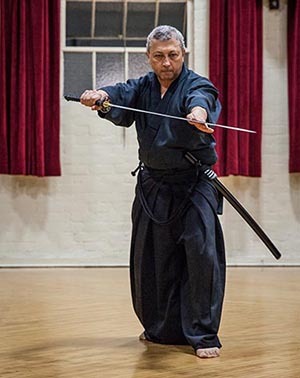 Following his teacher's passing, he was the chief instructor for Iaido at ACLA from then until 2013. He established Kenshokai in 2013 in order to preserve Furuya Sensei’s Iaido teaching tradition. Myers Sensei has his godan (fifth degree) ranking in Iaido. Gary is the proprietor of Yoshino Japanese Antiques in Arcadia, CA. He began his love for Japanese culture and art over thirty-five years ago and has been an avid collector ever since. He originally opened his store in Pasadena in 1992. It is through this passion for all things Japanese that Myers Sensei began his study of swords and swordsmanship. Myers Sensei has given lectures at Japanese American Community and Cultural Center, Huntington Museum, Pacific Asia Museum on numerous topics including Japanese swords and armor, textiles, Japanese furniture, and the impact of arts and crafts of Meiji Japan on Western art. Iaido is an ancient sword discipline first developed around the 1550's in feudal Japan. 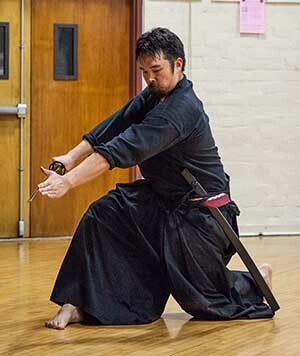 Each of the many schools of Japanese swordsmanship has been handed down within the Samurai warrior class with its own traditions and culture. 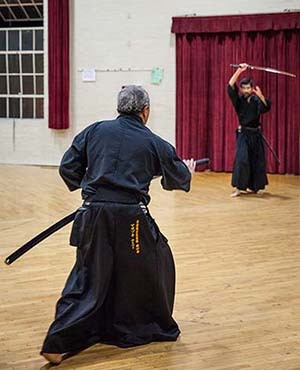 In present day, as has been the case throughout the history of Iaido, the practitioner not only works to develop martial proficiency, but through training, increases the depths of his spirit, control and focus. It is in the development of these internal attributes that modern Iaido finds its greatest benefit. First and foremost we teach Muso Shinden Ryu, the tradition developed by Nakayama Hakudo. It is the prevalent Iaido in the Eastern portion of Japan and in the Tokyo area. It is composed of three levels: Shoden, Chuden, Okuden. Shoden (the first level) is based on techniques of Omori style, with many techniques beginning in seiza (seated position). Chuden (the middle level) techniques are based on Hasegawa Eishin Ryu style. Finally Okuden (the advanced level meaning "Hidden") techniques are based on the Hayashizaki Ryu style. Each level is a building block on the next. Click here to see the number and names of the Muso Shinden Ryu techniques. Seitei-Gata forms in this curriculum were developed for the Iaido section of the All Japan Kendo Federation. 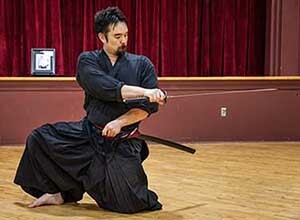 The set of techniques were selected from different Ryu to give the practitioner an overall idea of different levels and forms of Iaido. Masters of Muso Jikiden Eishin Ryu, Muso Shinden Ryu, Hoki Ryu, and Tamiya Ryu developed this set over several decades. The forms of Toyama Ryu are based on the techniques developed by several martial artists including Nakayama Hakudo for the Toyama Military Academy. These techniques offer a range of sword attack positions and were meant to be a practical sword guide for conscripted soldiers. Kumitachi forms are paired techniques in which there is an attacker and a defender. These forms promote the timing and spacing of swordsmanship techniques with the swords already drawn. Since these are done in pairs the sword cuts are stopped short of their target. Advanced practitioners who have control of mind, spirit, body and sword generally do these techniques. Students begin with a bukuto or bokken (wooden sword), then advance to mogito, then shiken. The All Japan Kendo Federation kumitachi forms include seven tachi, long sword techniques and three kodachi, short sword techniques. Toyama Ryu also has six kumitachi forms. We also teach Aikiken forms from the Aikido weapons curriculum.